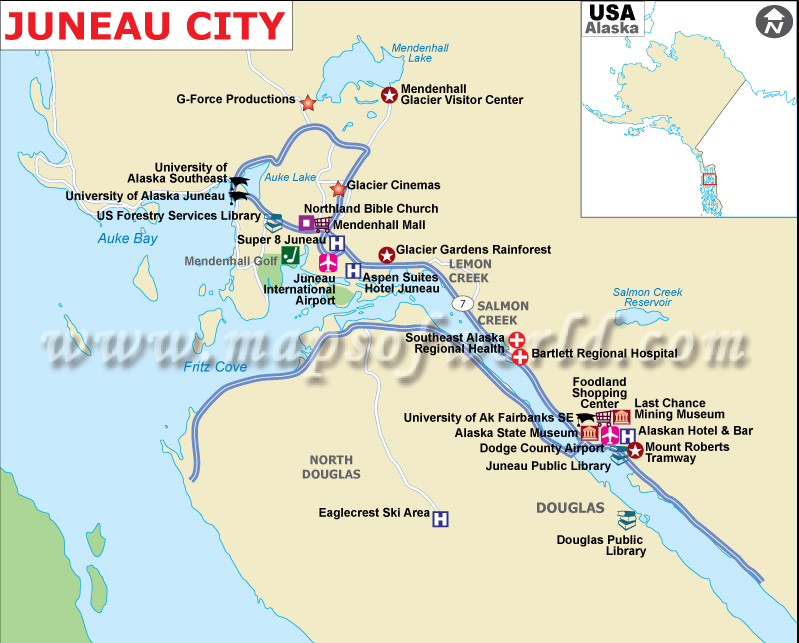 After our morning exploration of Juneau it was time to meet our fellow “explorers” and hop onto a tour bus to travel 19km (12ml) north along one of Juneau’s two major roads (in blue on the map). Our destination was the base of the Mendenhall Glacier, the only glacier we would be able to get to, in a fairly close up and personal way, on this trip to the Inside Passage area of Alaska. Mendenhall Glacier, top centre on the map, on the northern side of Mendenhall Lake, is a glacier in retreat. Early mention of the glacier came from Joseph Whidbey, master of George Vancouver’s ship HMS Discovery, who visited the area in 1794. He noted that most waterways here were unnavigable because of ice flows from glaciers. 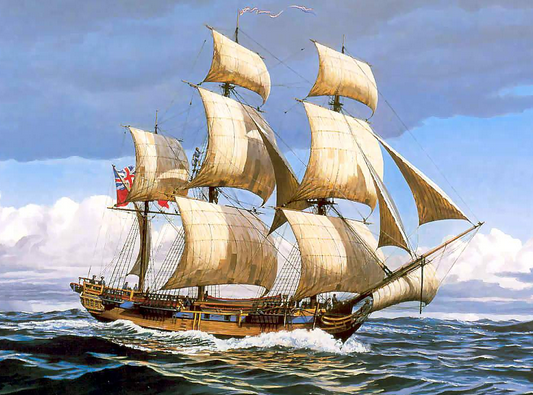 Of course, shipping was so much different then…. no ice breaking hulls and only wind power, so exploring in amongst the islands of the Inside Passage would have been all but impossible for such a sailing ship. Boat parties were sent out to chart some of the coasts of some of the islands. However, that was all that was possible before Vancouver turned south again to return to England. By 1888, when the famous naturalist John Muir came to explore in the area, the native peoples, the Tlingits, inhabited part of the valley left by the retreating glacier. 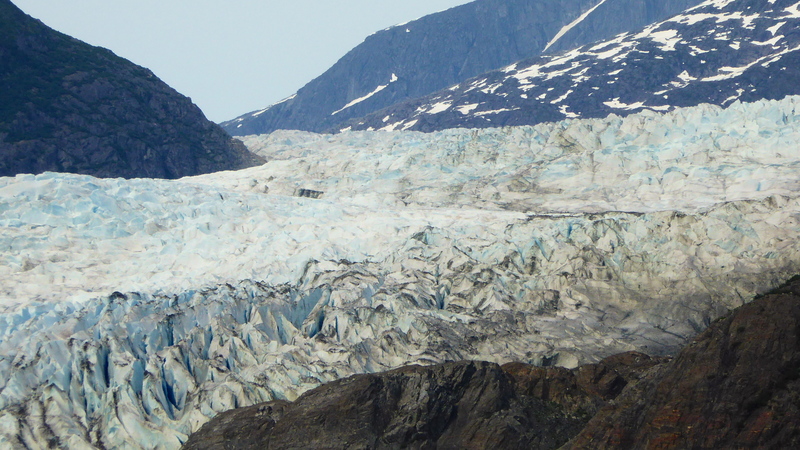 Muir gave the glacier the name Auke (or Auk) in honour of that group of Tlingits known as the Auk Kwaan. But the name was changed in 1891 to honour an American physicist and meteorologist, Thomas Mendenhall, the Superintendent of the US Coast Guard and Geodetic survey. 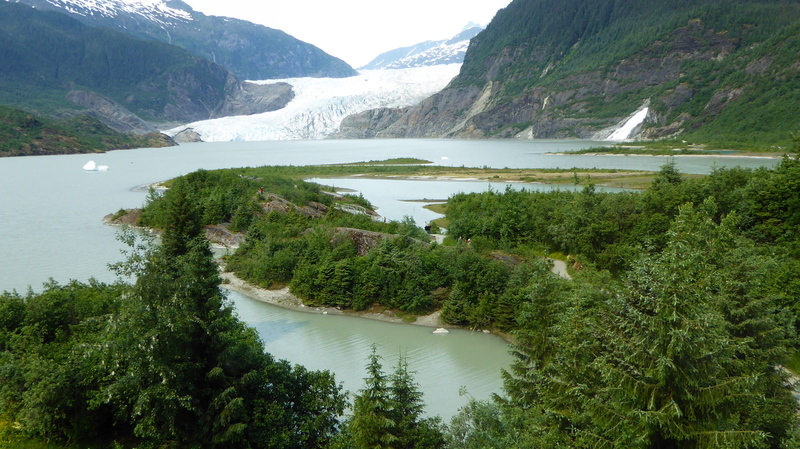 The glacier has been monitored since 1942, so it is known that Mendenhall Lake is a modern day lake, created by the large amount of moraine pushed down while the glacier has been retreating rather quickly, (2.82km or 1.75 ml), since 1958. 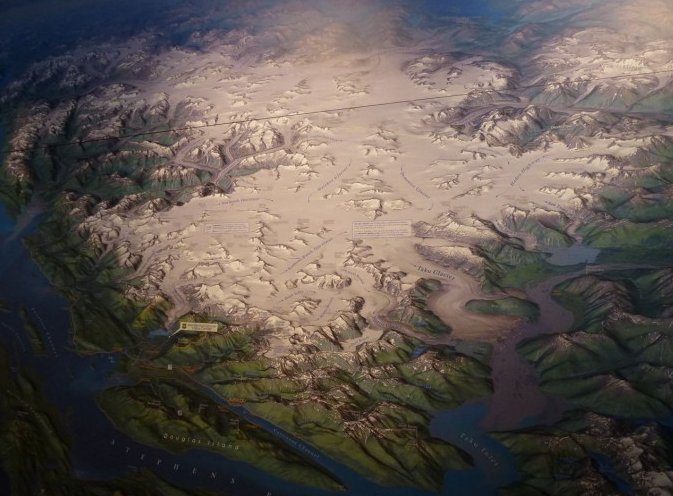 It is thought that the glacier has retreated a total of 4km (2.5ml) since the 1500s. With warming temperatures it is expected to retreat further. Viewed from the “Discovery Centre”, it’s easy to see how the glacier melt has gradually formed the lake with piles of murrain. Much of that moraine is now covered with young trees. 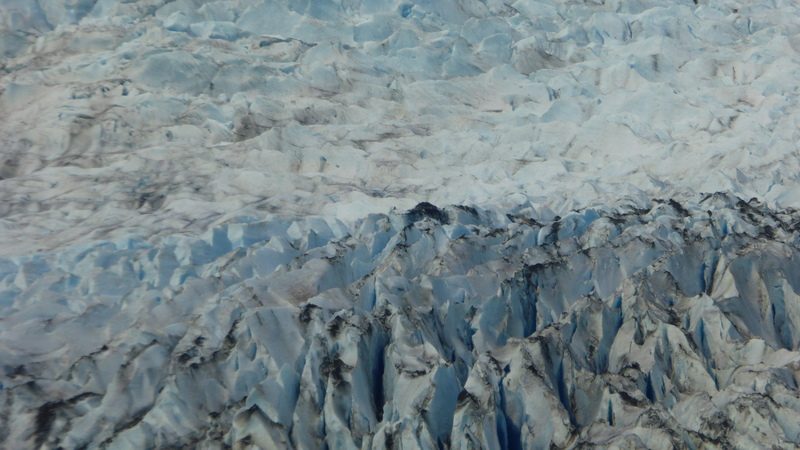 The sides of the glacier are still all but devoid of vegetation. 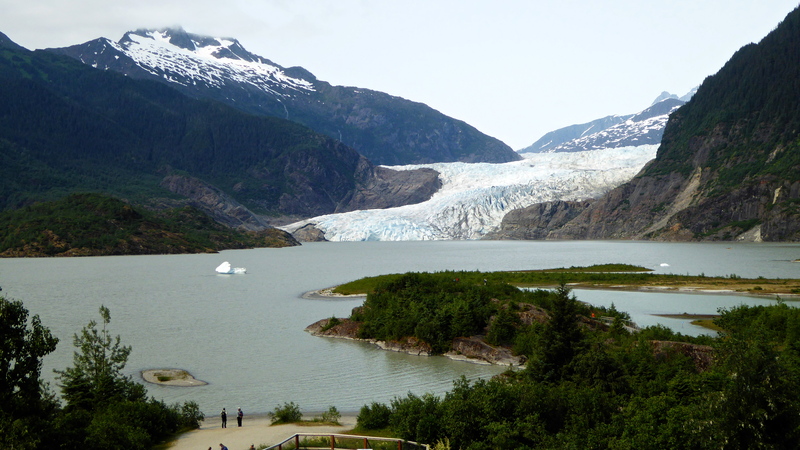 The glacier itself vanishes into the distance for 19 kilometres (12ml) to where it joins the vast Juneau Icefield. either by small plane or by helicopter. Our group took the option of viewing the glacier from ground level. 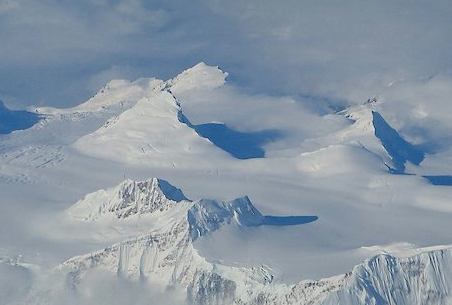 Juneau Icefield from maps in the Park Centre. At the Discovery Centre, a map shows the extent of the Juneau Icefield which covers 3,900 square kilometres (1,500 sq ml) and crosses the border between USA and Canada. Mendenhall (pin pointed by the small banner on the left) is just one of 40 major glaciers spawned by this Icefield. There are also about 100 smaller ones. All are in retreat except for the Taku Glacier, centre right, which filled its valley with so much glacial moraine that it has blocked its own waterway. It can no longer calve and has steadily been growing. 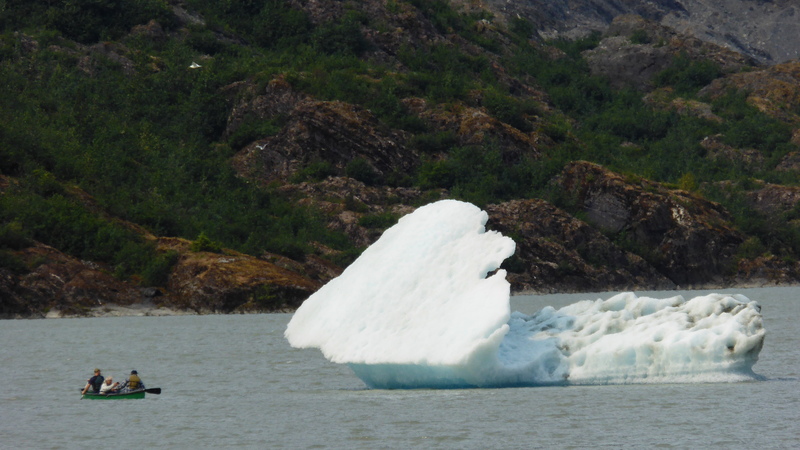 Calving happens when a chunk of ice breaks off the face of a glacier. This chunk of ice now floats in the lake. The men in the row boat give an indication of scale as does the next photo. Most chunks that we saw calving were much smaller than this one and are invisible in the longer distance. There were two paths to follow. One through the trees towards the waterfall and one down to the lake’s edge. David chose the former; I chose the latter. David’s aim was to seek out some of the native plants of the area. Mine was to take a closer look at the glacier. The face of a glacier is a truly magnificent, awe inspiring sight. It makes one feel quite small. 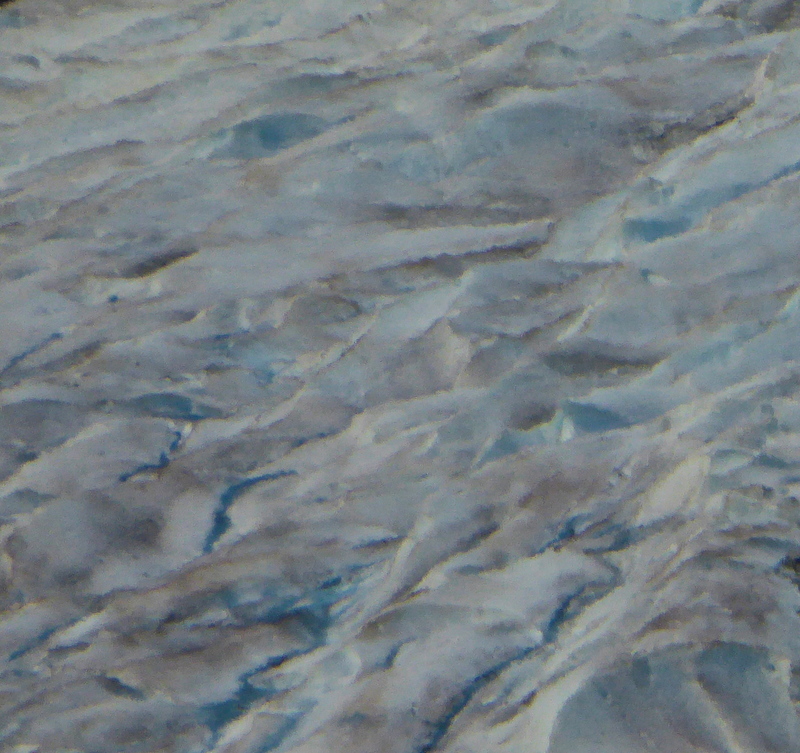 The leading edge of the glacier is very dirty although the ice itself has a lovely blue tinge. The dirtiness is made up of earth and rocks carved out from the mountain sides by the moving glacier. 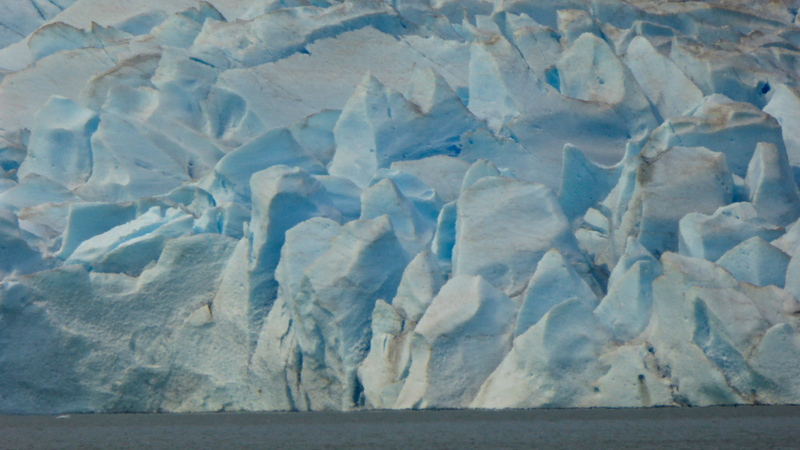 An even closer look, thanks to my 30 times camera, shows the great, blue chunks of ice that will eventually calve from the glacier, each one shrinking the total ice mass. What will be the future of this glacier? Who can tell? How much does global warming effect them? There are so, so many questions we need to answer about the health of glaciers… and of our beautiful planet! From afar the iceberg looks white. But what is white? This close up shows the many colours that an artist would need to use. 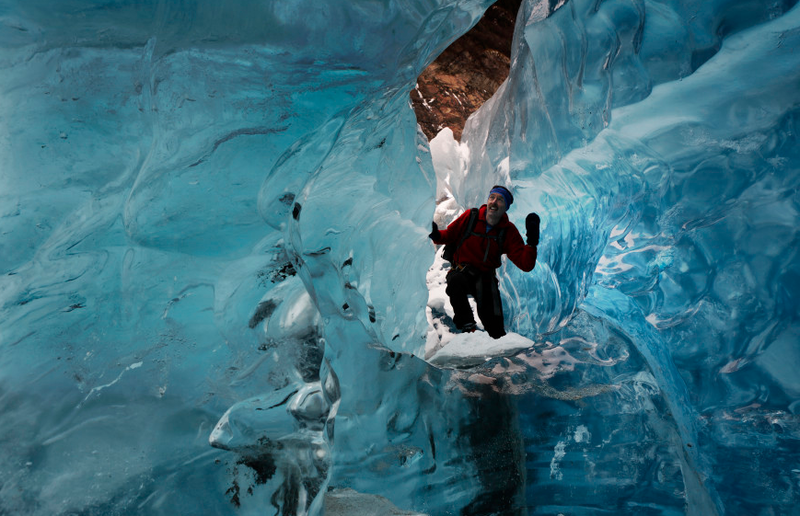 The beautiful blue of the ice is much more evident under the glacier inside the Mendenhall Ice Caves. I found this photo in a wonderful set of photos of these ice caves on the internet and will add the site below for those who wish to enjoy that aspect of the glacier. Going into that cave is certainly something I wouldn’t do, but I’m always grateful to those who do and who share their experience. This we hoped to do on this expedition into the wilderness of Alaska. the native flora of the area, the Tongass National Forest.